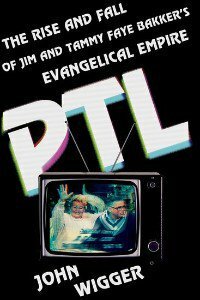 In 1974, Jim and Tammy Bakker founded a little television program they called The PTL Club. It began inauspiciously in a former furniture store, but by the mid-80s had exploded into a bona fide phenomenon and a ministry that reached around the globe. They traveled the world, dined with presidents, and gathered countless millions of followers. They became rich and powerful, owners of a massive 2,300-acre ministry center and theme park. They also became almost unbelievably corrupt. By 1987 it all collapsed beneath the inevitable financial and sexual scandals. It was a ministry implosion that electrified the nation and made Evangelicals a laughing stock. The story of the Bakkers and their ministry is told skillfully in John Wigger’s new book PTL: The Rise and Fall of Jim and Tammy Faye Bakker’s Evangelical Empire. There are, I think, several compelling reasons to read this book. First, from a purely historical perspective it is endlessly interesting. We see an empire rise and collapse; we see characters gain fame, then notoriety; we see all of the corruption, infighting, and ugliness that will inevitably attend such an horrific ministry. It gets even more interesting when Jimmy Swaggart begins to wield his influence to destroy the ministry and when Jerry Falwell attempts to become its leader. Second, it is an apt warning to Christians that character matters so much more than results, that godliness is infinitely more important than gathering a crowd or gathering donations. The Bakkers were known for being known, known for being famous. Yet at any time, any of their viewers could have clearly seen that they were woefully unqualified to be in a position of Christian leadership. Third, it shows the utter odiousness of the prosperity gospel. And perhaps this was one of my most unexpected takeaways. I hate the prosperity gospel and hate how it bilks the masses out of their hard-earned money. But what this book shows is how it also corrupts those who receive the money, giving them license to waste it just as quickly as it pours in. Wigger shows that the construction of their massive Heritage USA theme park reflected a prosperity gospel mentality that set aside reason and accountability in favor of an irrational trust in divine provision. At the end of it all, you come to know the Bakkers and, more than ever, to hate what they represent. You learn of the people who assisted them in their corruption and who helped them defraud the masses. You come to hate that so many of them and their successors remain on television today, still enriching themselves at the expense of others. PTL is published by the very respectable Oxford University Press, so never threatens to devolve into a tabloid. Even when it deals with scandalous material, it does so in a way that conveys information without being crass or voyeuristic. It’s an interesting, helpful, much-needed account of one of Evangelicalism’s ugliest hours.